Mode of occurrence and associated minerals. In the isometric system there are three equal axes at right angles to each other. In the tetragonal system there are three axes at right angles to each other. Two of these are equal, while the third, or vertical angle, is longer or shorter. There are two divisions of the hexagonal system; the hexagonal system properly so-called, and its rhombohedral division. All forms are referred to four axes, three equal axes inclined to each other at angles 60 degrees in a common horizontal plane, and a fourth vertical axis at right angles, and longer or shorter. The rhombohedral division comprises crystals having but three planes of symmetry, intersecting at angles of 120 degrees in the vertical axis. They are regarded as half forms of the corresponding hexagonal crystals. In the orthorhombic system there are three unequal axes at right angles to each other. In the monoclinic system there are three unequal axes, of which one, the lateral axis, is inclined to the vertical, while the angles between the others are right angles. In the triclinic system there are three unequal axes and these intersections are all oblique. The student who wishes to pursue this subject further should consult Dana's System of Mineralogy. Physical Mineralogy. Cleavage is the line of easiest separation in a mineral. It may be perfect, imperfect, interrupted, etc. Fracture, referring to any surface except that of a cleavage fall, may be uneven, conchoidal (shell-like), hackly (rough), etc. Tenacity refers to such qualities as brittle, sectile, malleable, flexible, or elastic. Talc. Scratched by the finger nail. Gypsum. Ditto, but with more difficulty. Will not scratch a copper coin. Calcite. Scratched by a copper coin. Fluorite. Is not scratched by a copper coin and does not scratch glass. Apatite. Scratches glass, but with difficulty. Is readily scratched by a knife. Feldspar. Scratches glass with ease. Is difficult to scratch by knife. Quartz. Cannot be scratched by a knife and readily scratches glass. Diamond. Scratches any other substance. Hardness may be intermediate. For instance, any mineral that scratched quartz and is soft enough to be scratched by topaz, in turn would be rated at 7.5. Specific Gravity. This is the density of mineral and other substances compared with that of water. It is particularly valuable in determining heavy metals. To find the specific gravity of any solid body divide its weight in air by the loss of weight in water, at a temperature as near 60 degrees F. as possible, and the quotient will equal the specific gravity. In the case of gases, such as nitrogen, oxygen, etc., hydrogen is taken as the unit. Luster. There are seven kinds of luster, viz: Metallic, the luster of metals; adamantine, that of the diamond; vitreous, of broken glass; resinous, of the yellow resins; greasy; pearly; silky. There are five degrees of intensity of luster recognized, viz: Splendent; shining; glistening; glimmering; dull. Color and Streak. The streak is the color of the powder of the mineral when rubbed on unglazed porcelain, or scratched with a knife. Transparency. Minerals may be transparent, sub-transparent, translucent, sub-translucent, opaque. Taste. Minerals may be salt, bitter, sweet, etc. Odor. This test is not of much use with most minerals until heat is applied. All the petroleum oils, however, are often detected by their odor. Chemical Composition. This may always be determined by suitable tests with reagents. Pyrognostic Characters. As a means of readily determining the nature of a specimen the blowpipe is unrivalled--if in the hands of one who understands it. Mode of occurrence and associated minerals. A knowledge of these matters often assists in a determination. A regular fire assay is not within reach of many prospectors, for the necessary apparatus cannot, as a rule, be carried in the wilderness. Whenever possible, however, a fire assay gives the truest results, especially in the case of gold and silver. The operation includes testing the ore, sampling and pulverizing, weighing the ore and reagents, calcination and roasting, reduction and fusion, distillation and sublimation, scorification and cupellation, inquartation and parting the gold and silver, weighing and tabulating. "Notes on Assaying" by Dr. Ricketts is a very useful manual to have at hand. 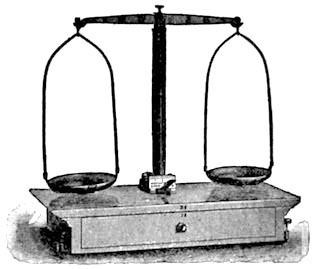 A pair of scales for weighing ore and buttons of base metal. It should take 10 ounces in each pan, and show 1/20 of a grain. A bullion scale to be kept strictly for the precious metals. Loaded with one gramme, it should show 1/20 of a milligramme. 2000 lbs. : 1 A.T. :: 1 oz. Troy : 1 milligramme. To use this system, weigh out one A.T. of the ore and whatever number of milligrammes of gold and silver the assay gives indicates an equal number of Troy ounces to the ton of 2000 lbs. Avoirdupois. 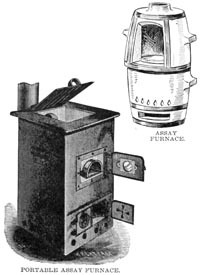 A muffle and a melting furnace, portable and of medium size, are handy, though furnaces may be built of ordinary brick, lined with fire brick, that would be better for permanent use. The fuels may be coke, anthracite or bituminous coal, charcoal, oil or gas. 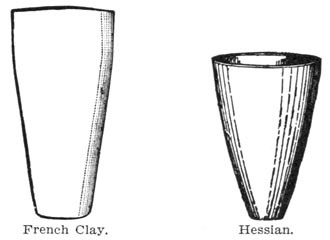 Crucibles of black lead, French clay, Hessian sand, and quicklime are necessary to hold the assay. Roasting dishes, scorifiers and cupels are required. The cupel is made of the ashes of burnt bone, and it is better to make them on the spot, as the bone ash may be carried anywhere without damage, whereas the cupels are very fragile. The bone ash is moistened with water, stamped in a cupel mould, and allowed to dry slowly. A good one will absorb its own weight of lead, but it is better to calculate on its absorbing but three-quarters of that amount. The crucible, scorification and cupel tongs, a couple of hammers, iron pestle and mortar, sieves from 20 to 100 mesh, and scorification mould complete the requisite tools. In addition, however, the assayer will require quite a bulky lot of apparatus, reagents and chemicals. All dealers keep lists of assayers' supplies on hand, and a full and complete assortment will cost about $200 in New York or Chicago. Quart bottles, with glass stoppers; ordinary corked bottles, ring stands, alcohol lamps, wash bottles, test tubes, horn spoons, iron pans, parting flasks, annealing cups, glazed black paper--these will suffice, provided the assayer has, as well, the outfit recommended for blow-pipe work. Dry reagents, such as litharge, borax (crystallized), silica, cyanide of potassium, yellow prussiate of potash, argol, charcoal, starch, metallic iron, pure lead, nitre, powdered lime, sulphur, carbonate of ammonia and common salt are necessary. As solvents and precipitants, distilled water, sulphuric, nitric and hydrochloric acids, chloride of sodium, nitrate of silver and sulphuretted hydrogen are also indispensable. This will seem rather a formidable list, and so, under certain conditions, it may be; indeed, where means of transport is limited, all regular assay work must be postponed until the return to civilization. Assaying is not, however, difficult, being mostly a matter of rule of thumb, and correct results may be arrived at without a deep knowledge of chemistry, although such knowledge will never come amiss. A preliminary examination will show what the ore probably is. The blow-pipe is especially useful, though to the skilled assayer often unnecessary. The ore is first powdered, and any metallic flakes picked out and tested separately. A fair sample must be selected, otherwise all the work will be thrown away and the result be valueless. The next step is weighing the ore and the reagents. Moisture is drawn off by heating in a crucible, a low heat being sufficient. Roasting will eliminate sulphur, antimony, arsenic, etc., and must take place in a flat dish, so that the air may have free access. The powder should be stirred frequently. Reduction is the operation of removing oxygen, and it takes place usually in a crucible or scorifier. Scorification consists in placing the ore in an open dish with proper reagents, and collecting all the volatile ingredients in the slag. Cupellation, on the other hand, collects them in the bone ash, of which the cupel is composed. When silver must be separated from gold, it is sometimes convenient to increase its proportion by the addition of some known weight of the inferior metal. After fusing, the globule is placed in nitric acid, and the silver parted from the gold, which may then be weighed. This result subtracted from the weight of the original globule gives the amount of silver. To test an ore for gold, take a pound of it, crush in mortar and pass through a fine sieve. Take one-fourth ounce Troy of the powder. Place in scorifier with an equal amount of litharge. Cover with borax that has been melted and powdered, and put the scorifier in the muffle of the furnace. A blacksmith's forge might do at a pinch. Heat until the mass has become a fluid, possibly twenty or thirty minutes. Next pour into the scorification mould, and, after the slag has set, remove it with a hammer. Hammer the button into a cube and place it in the cupel, which must first have been thoroughly heated. Heat until all the base metal has been absorbed by the cupel and the button has "brightened," or flashed; when this occurs, remove the cupel to the front of the muffle, cool, and remove the button with pincers. Weigh it, and you have the amount of gold and silver in 1/4-ounce Troy. A simple sum in proportion gives the amount in a ton. All ores containing sulphur, arsenic, antimony, or zinc, should be roasted. There are three stages in the scorification process; roasting, fusion, and scorification. During the first, the heat should be moderate until fumes cease to be given off; during the second, the heat is raised and a play of colors is seen on the surface of the lead; in the closing stage, the heat is lowered for a time until the slag covers the lead, when it is again raised for a short time and the scorifier removed. Brittle buttons may be due to arsenic, antimony, zinc or litharge, and must be re-scorified before cupellation, with more lead. Take the cupel slowly from the fire to avoid "spitting," by which portions of the buttons are lost. Watch closely for the brightening. Silver is volatile at a high heat, but when the muffle is almost white, the metal well fused and clean, the fumes rising slowly, and the cupel a cherry red, all is going smoothly. If the fumes rise rapidly, the muffle is too hot. On the other hand, dense, falling fumes show the temperature is too low. Lead that is poor in silver stands the highest heat without vitiating the assay. 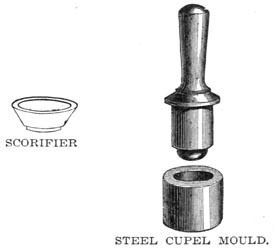 When the material in the cupel "freezes," i.e., the absorption by the cupel stops, reject the assay and try again, giving more heat or more lead. Gold. Practically, the metal most prospectors seek is gold. It is so enormously valuable and constitutes so very small a percentage of any ore, that care must be taken or it may escape detection and be lost. Panning is the miner's method. He crushes his ore thoroughly, and places it in the pan with water; then, with a motion easy to learn but difficult to describe, he swirls the water around, allowing a little of it to escape at each revolution, carrying with it the rubbish, until finally he has a little black sand and perhaps a few grains of yellow substance, which is gold. Mica, or fool's gold, puzzles nobody but the ignoramus. True, it looks like gold in certain positions and lights, but gold will beat out thin under the hammer, just as lead would, while mica will break up into a floury powder. Mica is very light, while gold is very heavy; so there is no excuse for confounding the two. 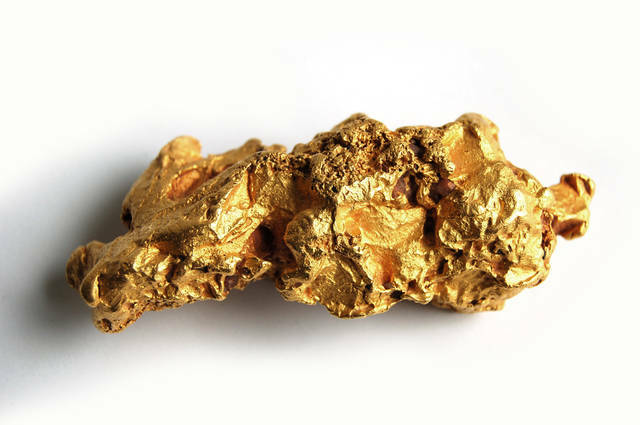 If an ore contains sulphurets and gold, the latter may be coated with some sulphur or arsenic, which would prevent the gold from amalgamating. The only remedy for this is roasting. No single acid will dissolve gold, but a solution known as aqua regia, made up of three parts of hydrochloric acid and one part of nitric acid, dissolves it. If to the solution so obtained you add some sulphate of iron, you will get a precipitate which is metallic gold, although it does not look like it, as it is brown in color; but if you place this precipitate in a crucible and heat, you will get a yellow bead of pure gold. Another test for gold is to take the solution as above obtained and add thereto a solution of chloride of tin, when you obtain a purple coloration that has been called the purple of Cassius. Gold may be distinguished from all other metals by the three following tests: It is yellow; it may be flattened by the hammer; it is not acted upon by nitric acid. Pure gold is soft, and the point of a knife will scratch it deeply. Pounded in a mortar, the pulverized mineral should be passed through a cheese-cloth screen stretched over a loop of wood. If the course contains much pyrite, it must be roasted before washing in the pan and amalgamating. Sample well, weigh out two pounds, put it in a black iron pan, with four ounces of mercury, four ounces of salt, four ounces of soda and a half gallon of boiling water. Stir with a green stick, and agitate until the mercury has been able to reach all the gold. Pan off into another dish so as to lose no mercury, squeeze the amalgam through chamois leather or new calico previously wetted. The pill of hard amalgam may be placed on a shovel over the fire or in a clay tobacco pipe and retorted. Gold is readily acted upon by the mixture of nitric and hydrochloric acids known as aqua regia, or by any solution producing chlorine. Some of the mixtures which attack it are bisulphate of soda, nitrate of soda and common salt, hydrochloric acid and potassium chlorate, and bleaching powder. The action is more rapid in hot than in cold solutions, and impure gold is more easily dissolved than pure. Mercury dissolves gold rapidly at ordinary temperatures, the amalgam being solid, pasty or liquid. Gold rubbed with mercury is immediately penetrated by it. An amalgam containing 90 per cent. of mercury is liquid; 87.5 per cent., pasty; 85 per cent., crystalline. These amalgams heated gradually to a bright red heat lose all their mercury, and hardly any gold. About one-tenth of 1 per cent. of mercury remains in the gold until it is refined by melting. The veins from which the gold of the world is won do not, on an average, hold the precious metal in greater proportion than one part of gold in 70,000 parts of veinstone. Under favorable conditions a proportion not one-fifth as rich as this, may yield a rich return. In hydraulic mining on a large scale, one part of gold in 15,000,000 parts of gravel has paid a dividend. A test known as Darton's is believed to be a valuable means of detecting minute quantities of gold in rocks, ore tailings, etc. "Small parts are chipped from all the sides of a mass of rock, amounting in all to about 1/4 ounce. This is powdered in a steel mortar and well mixed. About half is placed in a capacious test tube, and then the tube is partly filled with a solution made by dissolving 20 gr. of iodine and 30 gr. of iodide of potassium, in about 1-1/2 ounces water. The mixture thus formed is shaken and warmed. After all particles have subsided, dip a piece of fine white filter paper in it; allow it to remain for a moment; then let it drain, and dry it over the spirit lamp. It is next placed upon a piece of platinum foil held in a pincers, and heated to redness over the flame. The paper is speedily consumed; and after again heating to burn off all carbon, it is allowed to cool and is then examined. If at all purple, gold is present in the ore, and the relative amount may be approximately deduced. This method takes little time, and is trustworthy." "Take 100 to 1000 grains and attack with aqua regia in a flask; cool for about thirty minutes or more; dilute with water and filter. If gold is present, it will now be held in solution in the filtrate. Remove the filter and evaporate the filtrates to dryness; then add a little hydrochloric acid, evaporate and re-dissolve the dry salt in warm water; add to the solution so formed proto-sulphate of iron; which will throw down the gold in the form of a fine, dark precipitate. The precipitate is seldom fine, being mixed with oxides of iron, and must now be dried in the filter paper, and both burned over the lamp in a porcelain dish. Then mix the dried precipitate with three times its weight of lead; fuse, scorify and cupel. In case platinum, iridium, etc., are found associated with the gold, an extra amount of fine silver should be added before cupellation, and the gold button will be found pure." "It must be understood that this is only a working test. It does not give all the gold in the rock, as shown by a careful fire assay, but what is of equal importance to the mine-owner, mill-man, and practical miner, it gives what he can reasonably expect to save in a good quartz mill. It is really milling on a small scale. It is generally very correct and reliable, if a quantity of material be sampled. The only operation which requires much skill is the washing, generally well understood by those who are most likely to avail themselves of the instructions. These rules apply equally to placer gravels. Take a quantity of the ore--the larger the better--and break it into egg-sized pieces. Spread on a good floor, and with a shovel mix very thoroughly; then shovel into three piles, placing one shovelful upon each in succession until all is disposed of. Two of the piles may then be put into bags. The remaining pile is spread on the floor, mixed as before, and shovelled in the same manner into three piles. This is repeated according to the quantity sampled, until the last pile does not contain more than 30 pounds of ore. As the quantity on the floor becomes smaller, the lumps must be broken finer until at last they should not exceed one inch in diameter. The remainder is reduced by a hammer and iron ring to the size of peas. The whole 30 pounds is then spread out, and after careful mixing portions are lifted with a flat knife, taking up the fine dust with the larger fragments, until about 10 pounds have been gathered. This quantity is then ground down fine with the muller, and passed through a 40-mesh sieve. If the rock is rich, the last portion will be found to contain some free gold in flattened discs, which will not pass this sieve. 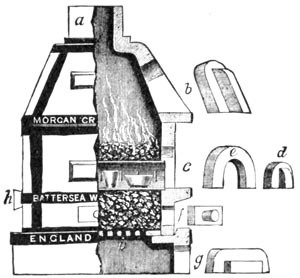 These must be placed with the pulverized ore, and the whole thoroughly mixed, if the quantity is small, but if large must be treated separately, and the amount of gold allotted to the whole 10 pounds and noted when the final calculation is made. "From the thoroughly-mixed sample, two kilogrammes (2000 grammes) must be carefully laid out. This is placed in a pan or, better, in a batea, and carefully washed down until the gold begins to appear. Clean water is then used, and, when the pan and the small residue are cleaned, most of the water is poured off and a globule of pure mercury (which must be free from gold) is dropped in, a piece of cyanide of potassium being added with it. As the cyanide dissolves, a rotary motion is given the dish, best done by holding the arms stiff and moving the body. As the mercury rolls over and ploughs through the sand, under the influence of the cyanide it will collect together all the particles of free gold. When it is certain that all is collected, the mercury may be carefully transferred to a small porcelain cup or test tube, and boiled with strong nitric acid, which must be pure. When the mercury is all dissolved the acid is poured off, more nitric acid applied cold, and rejected, and the gold is then washed with distilled water and dried. "The object of washing with acid the second time is to remove any nitrate of mercury which might remain with the gold, and which is immediately precipitated if water is first used. "The resulting gold is not pure, but has the composition of the natural alloy. Before accurate calculations of value are possible, the gold must be obtained pure and weighed carefully. To purify the gold it should be melted with silver, rolled out or hammered thin, boiled twice with nitric acid, washed, dried, and heated to redness. "The method of calculating this assay is simple. It will be observed that 2000 grammes represent a ton of 2000 pounds; then each gramme will be the equivalent of one pound avoirdupois, or one 2000th part of the whole, and the decimals of a gramme to the decimals of a pound. Suppose the ore yielded by the assay just described, fine gold weighing .072 gramme, it must be quite evident that a ton of the ore would yield the same decimal of one pound. Now one pound of gold is worth $301.46, and it is only necessary to multiply this value by the weight of gold obtained in grammes and decimals to find the value of the gold in a ton of ore--$301.46 × .072--$21.70. The cyanide solution should be kept rather weak, as gold is slightly soluble in strong solutions of cyanide of potassium. Cyanide is a deadly poison." Touchstones are useful in deciding the probable value of gold alloys. Several pieces of the metal under examination are cut with a cold chisel, and the fresh edges drawn over the touchstone. These streaks are touched with nitric acid on a glass rod. Should no reaction follow, the gold is at least 640 fine. Wipe the stone with soft linen and try with test acid, made by mixing 98 parts of chemically pure nitric acid with two parts of hydrochloric acid, adding 25 parts distilled water by measure. If this has no effect, take a touch needle marked 700, and make a similar streak on the stone samples. Compare, and, if necessary, continue with the other needles, using a higher number each time. An approximate estimate of the sample will soon be obtained. Should the gold seem poorer than 640 fine, try with the copper or silver needle. Practice and a good eye soon make this method very certain in its results. Retorted amalgam is likely to contain mercury. To test for it, put a small fragment into a closed glass tube, taking care that it falls quite to the bottom. Heat the gold over a spirit lamp, and a deposit of mercury will soon be seen upon the colder sides of the tube above the bottom. The tube may be broken and the mercury collected into a globule under water. In mining regions gold dust passes current as coin, according to what is supposed to be its value. Occasionally counterfeit dust is offered. The readiest means by which it may be detected are as follows: The dust from any one district is always much alike, and any unusual appearance should create suspicion. Try any doubtful pieces on a small anvil, remembering that gold is extremely malleable. Test some of the gold with nitric acid; effervescence or evolution of red fumes, or coloration of the acid prove impurities to be present. 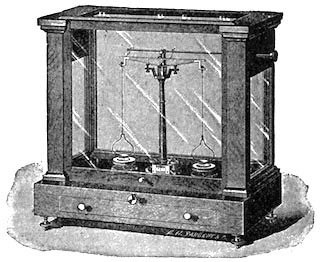 Place two watch-glasses (most useful in chemical tests) on paper; the one on a white sheet, the other on a black, and with a glass rod convey a few drops of nitric acid from the dish to each. To the glass on white paper add a drop or two of ammonia; a blue color would indicate copper. To the other add hydrochloric acid; should a white precipitate form, it proves silver. If no action is noticed, even after heating the dish, the dust is genuine. As "dust" is sometimes merely copper coated with gold, the better plan is to cut all the larger grains in two, so that the acid may attack the copper should it be present. Copper. Copper is a very easy mineral to test for. First crush the ore and dissolve it in nitric acid by heating. Then dilute with some water, and add ammonia. The solution should turn dark blue. The carbonate ores of copper do not extend deep in the mine. Their places are taken by copper pyrites. Sulphide ores are usually difficult to treat, and when they are to be tested it is better to roast them before trying the tests for color. The sample must be pulverized. Take an ounce of the powder, and place in a porcelain cup. Add forty drops of nitric acid, twenty drops of sulphuric acid and twelve drops of hydrochloric acid. Boil over the spirit lamp until white fumes arise. When cool, mix with a little water. Filter and add a nail or two to the liquid. The copper will be precipitated, and may be gathered up and weighed. The amount of copper in the sample multiplied by 32,000 will be the copper in a ton of the ore.
Should copper be suspected, roast the powdered ore and mix with an equal quantity of salt and candle grease or other fat; then cast into the fire, and the characteristic flame of copper--first blue and then green--will appear. This test is better made at night. Coal. Coal is often more valuable than gold, and the prospector should be prepared to estimate the value of any seams he may come across during his travels. The following is a very rough but wonderfully effective test for coal. Take a clay pipe, pulverize your sample, weigh off twenty pennyweights, and place it in the bowl of the pipe. Make a cover with some damp clay. Dry thoroughly, and put the bowl upside down over a flame. The gas in the coal will come out through the stem, and may be lit with a match. Let the pipe cool after the gas has all escaped, break off the covering of clay, and if the coal was adapted for coke the result will be a lump of that substance in the bowl. Weigh this. The difference in weight between the coke and the twenty pennyweights of coal that were placed in the bowl will represent the combustible matter forced out by the heat. Now take this coke and burn it on a porcelain dish over the lamp. You will have more or less ash left, and the difference in weight of the ash and the coke will be the amount of fixed carbon in the coal. Your test is complete, and it need not have cost you even the pipe. Sulphur is a detriment to coal, and if you notice much of it in the escaping fumes, you may be sure your sample is not worth much. Mercury. Cinnabar, the common ore of mercury, is a sulphide. Scratch it with a knife, and the streak will be bright crimson. Dissolve the ore in nitric acid, add a solution of caustic potash, and you have a yellow precipitate. A very pretty test is to place the ore pulverized in a glass tube with some chloride of lime; close the top of the tube, and place a smaller one therein, so bent that it will pass into a basin of water; heat the bottom of the tube containing the ore and lime, keeping the upper part and the small tube cold with wet rags, and you will have a deposit of quicksilver in the basin. Silver. Silver ore may be detected by dissolving a small quantity in a test tube with a few drops of nitric acid. Boil until all the red fumes disappear. Let the solution cool, and add a little water. Filter the whole, and add a few drops of muriatic acid, which will precipitate the white chloride of silver. Dissolve this precipitate with ammonia; then add nitric acid once more. Exposed to the light, the precipitate soon shows a violet tint. Pure silver is the brightest of metals, of a brilliant white hue, with rich luster. To detect chloride of silver in a pulp, rub harshly with a clean, bright and wet copper cartridge or coin, and if there be silver in the pulp the copper will be coated with it. Graphite will also whiten copper, but the film is easily rubbed off. Nickel. Nickel may be determined as follows: A little of the powdered ore taken up on the point of a penknife, and dissolved in a mixture of ten drops of nitric and five drops of muriatic acid, should be boiled over a lamp for a few minutes, and ten or twelve drops of water added. A small quantity of ferrocyanide of potash will throw down a whitish-green precipitate, indicating nickel. Platinum. Platinum is a most refractory metal to treat, as it must be boiled for at least two hours in the mixture of muriatic and nitric acid, known as aqua regia. A small amount of alcohol is to be added to the solution, and the latter filtered. The platinum is precipitated with ammonia chloride. Manganese. Manganese may be proved as follows: A few grains of powdered ore are placed in a test-tube, with three or four drops of sulphuric acid. Two or three grains of granulated lead or litharge being dropped in, the color will become pink should manganese be in the ore.
A preliminary examination of a mineral may be made with a pocket lens and a penknife. With the first, any conspicuous constituents may be recognized, while a scratch with the point of the latter will give an idea as to the softness or hardness of the mineral. Should much quartz (silica) be present, a sharp blow with the steel will cause sparks. The next test should be with some ore powdered and held over a spirit flame. A drop or two of water and a drop of sulpho-cyanide of potash will reveal iron, should such be present, by a deep red coloration. To another portion add one drop of hydrochloric acid, and a dense, curdy precipitate will indicate silver, if there be any. Added to the same original nitric acid solution, several drops of ammonia water would detect copper by a blue color. Antimony, tin, aluminum, zinc, cobalt and nickel, uranium and titanium are best shown by the blowpipe. Carbonates, that is those minerals that contain carbon and oxygen in addition to the metal, effervesce when brought into contact with hydrochloric acid. Some sandstones have a small amount of lime carbonate, and must be tried under the lens, as the bubbles are microscopic. These tests are extremely useful, but by no means infallible, owing to so few ores being pure. Drop a little powdered ore in a test tube; add nitric acid; dilute with 1/8 water; warm gently over the spirit lamp. It may dissolve or it may not. In the latter case, add four times as much hydrochloric acid. Should all these attempts fail, a fresh sample must be taken, and equal parts of sodium carbonate and potassium carbonate added, and the whole strongly heated in a platinum crucible. The contents, after cooling, is dissolved in dilute nitric acid. In any case the assay will now be dissolved, and will be in the solution. Filter. Pour ten drops into a test tube; add three or four drops of hydrochloric acid. A precipitate appears. It may be silver, lead or mercury. If silver, it grows dark violet after exposure to sunlight, or 30 or 40 drops of ammonia dissolves it in a few moments. Should it not dissolve, it is lead or mercury. Test for lead by filtering, and heating some of the precipitate on charcoal before the blow-pipe. A bead and yellow incrustation indicate lead. Should none of these things happen, then the metal is mercury. Filter; place in glass tubes; heat gently, and a mirror of quicksilver will appear on the sides of the glass. This is as far as the prospector, without the various reagents and chemicals that the analyst has always at hand, will be able to go. More complex treatment must be reserved until a return to civilization.